Populist brings you a bite sized round up of the best of Londonist this week. Catch up on the coolest, quirkiest, most recommended and talked about stories and find out what's hot and what's happening for the week ahead. Now on Saturdays! Recessionist considered the fallout from the Lehman's collapse. Good 2012 news: the Paralympics passed over no problem / Bad 2012 news: scammers abound and pensioners unhappy. Black cabs had a safety scare, there were more sheep on the Bridge and Hirst made a packet. With the renaming of the Hammersmith & City line Shepherds Bush station imminent, we got creative with alternative monikers and looked forward to the opening of new west London stations. It's Open House weekend! Go, explore, take photos, enjoy. Covent Garden was looking cool, replete with local celebrity. We also looked at style on another level, at London Fashion Week. We felt sorry for abandoned bears, had cupcakes delivered to our door, went shopping in Battersea and geeked out on heritage trains. The first ever silent gig 'rocked' Koko, the Lord has his birthday and got generous and Jason Donovan's returning the West End Stage in drag. Check out Music Choice, The Book Grocer, Saturday Cinema Summary, Repertory Film Roundup for more. 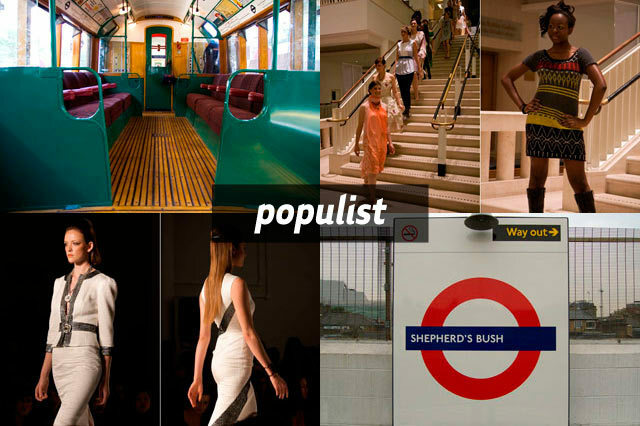 Images L-R clockwise: Art Deco tube train interior, ethical fashion at the British Library, London Fashion Week show and Shepherds Bush..... You can keep track of our most popular posts by checking out Favourites or using the Populist tag.